Το Μαζικό Ανοικτό Διαδικτυακό Μάθημα (MOOC) του ΤΟΥ διατίθεται για 2η φορά! Η συμμετοχή στο MOOC είναι δωρεάν! Οι εγγραφές είναι ανοικτές μέσω αυτής της σελίδας. 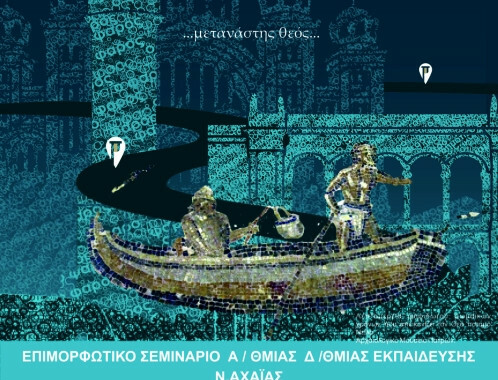 Στις 4 Μαρτίου 2019 και για 6 εβδομάδες, θα διατεθεί και πάλι το MOOC με αντικείμενο τη Διαγενεακή Μάθηση (Intergenerational Learning), το οποίο αναπτύχθηκε από την ερευνητική ομάδα DAISSy του ΕΑΠ στο πλαίσιο του Ευρωπαϊκού έργου ΤΟΥ+ . The DAISSy research group of Hellenic Open University (HOU), in collaboration with the National Center for Social Research (EKKE), organized the International Conference on “Diversity in Adult Education: Community, Integration, Governance” on 12 & 13 December 2018 at the Electra Hotel Athena. 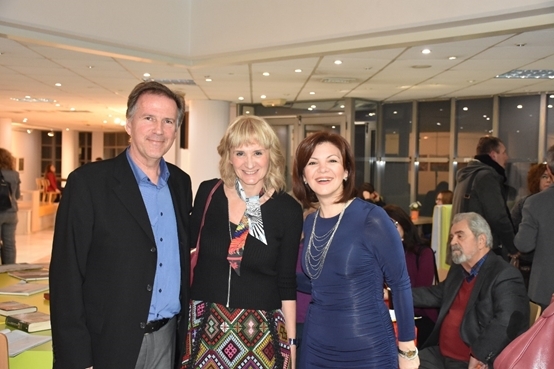 The conference marked the completion of the transnational European project DIVINA-EDU: Diversity in Adult Education. The Conference first explored the links between understanding and managing diversity in adult education. At a second, but clearly related level, however, the conference sought to unravel this exploration from a monolithic “educational” orientation. Thus, it demonstrated the more general implications that educational and diversity-centered approaches can have on broader issues such as community building, social inclusion, diversity management, etc. You can read more here! Although women constitute more than 50% of the European population, they have been traditionally underrepresented in the labour market and affected by unemployment more than men. According to Eurostat, at the beginning of 2018, the EU unemployment rate was 8,6% (around 18 mln. people) and half of them have been unemployed for more than one year. However, the share of women among those EU citizens without a job, is more than 50%. Project Entrepreneurship for Woman (E4W) aims at increasing women’s employability skills. Today problem solving, teamwork, creativity, organization, communication, leadership and digital competences are some of the core skills required by European labour market. The project will develop an entrepreneurship educational pathway for disadvantaged women through a project-based learning approach integrated with ICT in non-formal adult education institutions. During the two years of project lifetime, the course will be tested with the educators of non-formal adult learning organizations and women who would like to improve their project management and ICT skills. 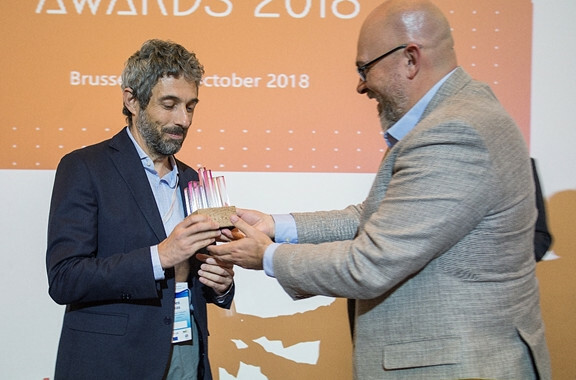 E4W is a Strategic Partnership coordinated Rural Internet Access Points from Lithuania and involving also the DAISSy research group of Computer Technology Institute and Press “Diophantus” from Greece, Simbioza Genesis from Slovenia and Stiftung Digitale Chancen from Germany. The project is funded in the Erasmus+/KA2 programme. 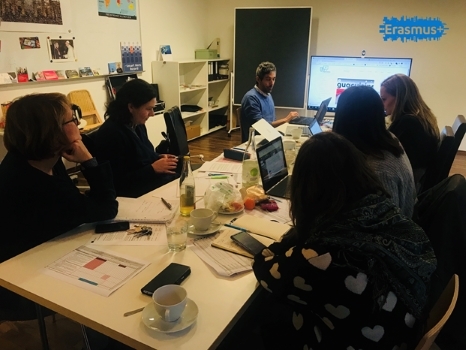 The project kick-off meeting took place in Berlin on December 17-18, 2018. Representatives of the four project partner organizations participated in the meeting that was hosted by SDC. Under the coordination of Laura Grineviciute from RIAP, the project manager, several details regarding execution and coordination of this multinational project were smoothed out and put together. 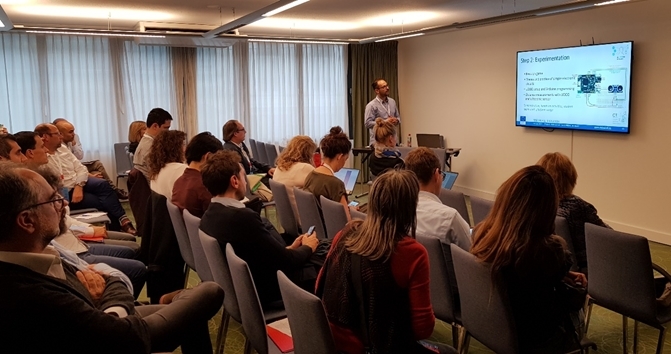 The first day of the kick-off meeting was dedicated to the presentation of partners’ experience and practice sharing on innovative teaching and learning methods in the fields of entrepreneurship, ICT and project management. The second day was oriented to detailing the activity descriptions of all project work packages, putting emphasis on the instructional strategy, the first project outcome that will be available this May. 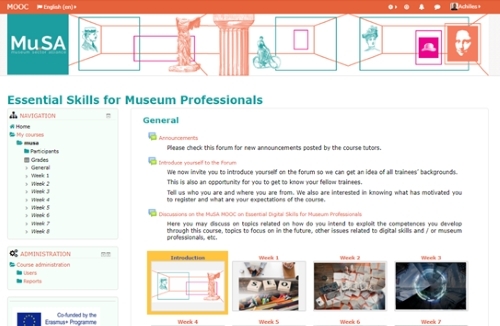 Today, January 7, 2019, the MOOC titled Essential skills for museum professionals was launched worldwide. 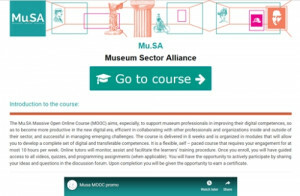 The MOOC was developed by the DAISSy research team of HOU as part of the European Mu.SA project: Museum Sector Alliance in collaboration with the project partners. 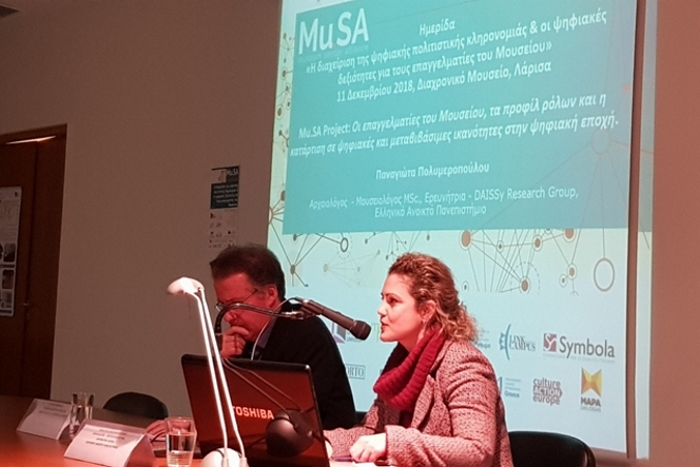 The Mu.SA project is co-ordinated by Dr. Achilleas Kameas, Professor of Hellenic Open University and is implemented in 4 European countries (Greece, Italy, Portugal, Belgium) by 12 organizations. The MOOC aims at enhancing the digital skills and 21st century skills of museum and cultural professionals. To this end, it consists of training modules based on the European e-competences framework (e-CF), DigComp and P21 – in fact the course is a unique combination of these standards, and for this reason it is considered as best practice at European level. The instructional design was based on learning outcomes and is modular in order to allow each trainee to study based on his / her pace and availability. The MOOC extends to 8 weeks of training and requires a total of 80 hours of training and study. 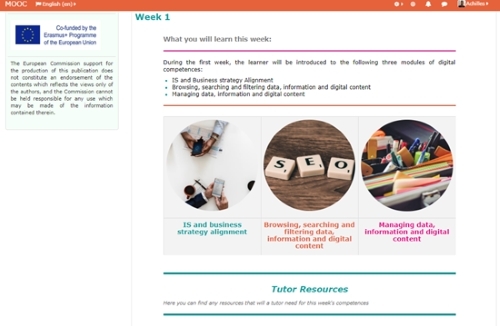 Each week, it focuses on 1 e-CF competence (a European standard of IT skills) and combines competences from DigComp (the global standard of digital literacy of the average citizen) and P21 (a 21st century skill model) frameworks. For each competence, a separate training module has been designed, the material of which is grouped in units. Each unit includes presentations, videos and study material related to a set of learning outcomes that are assessed at the end. 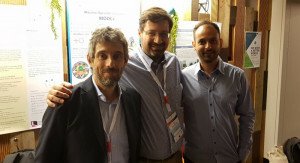 The training material has been produced in its entirety by the organizations involved in the project and is available in 4 languages: English, Greek, Italian and Portuguese. During the course there will be training support from tutors who have also planned participatory activities to be implemented through forums and social media. The training platform was developed by the DAISSy team of HOU and is available at https://mooc.cti.gr/. Up to now, more than 5,200 people have registered in the course from all around the world! We hope they will find the course interesting and will persist until they complete it. 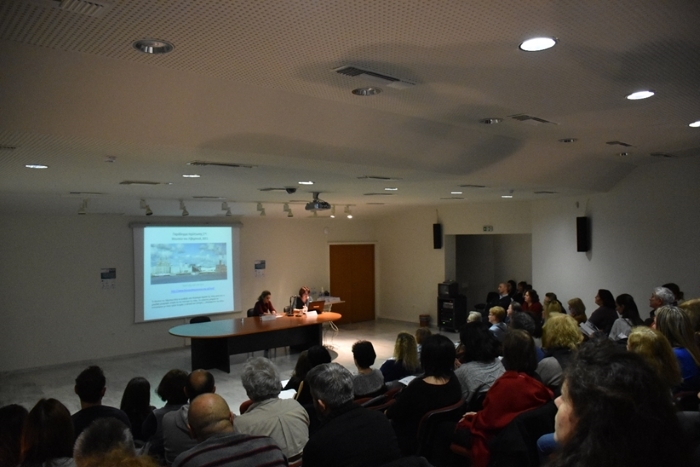 On Tuesday, December 11, 2018, at the Diachroniko (Diachronous) Museum of Larissa, the Infoday on “Digital cultural heritage management and digital skills for museum professionals” took place with great success. The Infoday was organized by the DAISSy research group of the Hellenic Open University, with the support of the Ephorate of Antiquities of Larissa, the Deputy Mayor of Culture and Sciences of the Municipality of Larissa, the “Hippocrates in Larissa” Association and the “Larissa – Learning City” initiative, with the support of European project Mu.SA. The staff of the Public Relations Department and the Larissa Annex of HOU contributed significantly to the success of the Infoday. Project Mu.SA – Museum Sector Alliance is funded by the Erasmus + / Sector Skills Alliance programme and coordinated by the DAISSy Research Group of HOU. The consortium comprises a total of 11 partners from 4 countries (Greece, Italy, Portugal, Belgium). The purpose of the Mu.SA project is to fill the gap between formal education and the labor market that has arisen due to the ever-increasing adoption of Information and Communication Technologies into the museums and the subsequent emergence of new specialties. With the aim of enhancing the digital skills of museum and cultural professionals, targeted training actions, including a MOOC, four hybrid training seminars and internships, were designed and implemented within the project. The certification is based on the European Skills Frameworks DigComp and European eCompetences Framework (e-CF). The project is a unique case of combining different competence frameworks and is already considered as good practice. Dr. Achilles Kameas, Professor of HOU, Director of DAISSy research group and Scientific Coordinator of Mu.SA project opened the Infoday. Brief welcome speeches were given by Mrs. Stavroula Sdrolia, Head of the Ephorate of Antiquities of Larissa and Director of the Diachroniko Museum of Larissa, Mr. Panos Sapkas, Deputy Mayor of Culture and Sciences of the Municipality of Larissa and the Director of Secondary Education of Larissa, Mr. Ioannis Kapsalis. The first part of the Infoday included the presentation by HOU Professor Mr. Achilles Kameas of the Mu.SA project and other European projects in which the DAISSy research group participates as coordinator or partner. 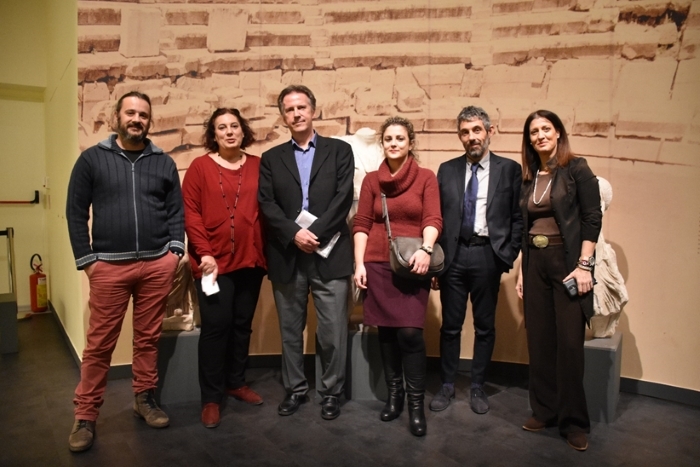 A description of the first research results of the project was given by Mrs. Panagiota Polymeropoulou, Archaeologist – Museologist MSc. and Researcher at DAISSy. 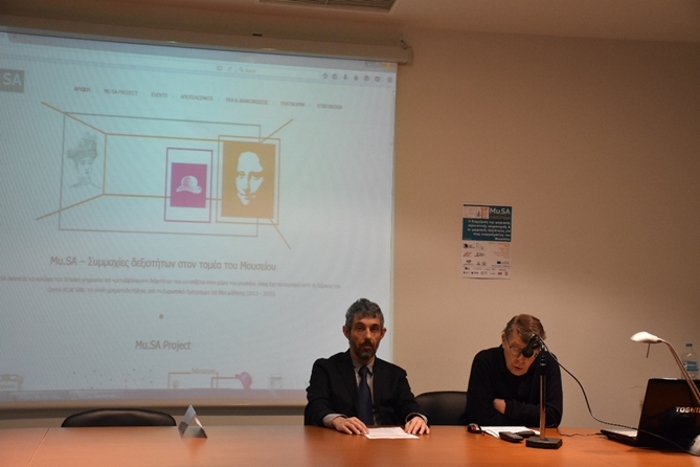 Mrs. Polymeropoulou presented in detail the four professional profiles produced in the project and the training program that was developed, which includes an initial Massive Online Open Course (MOOC) on the basic digital skills that museum professionals need to acquire, specialized training programs and internships. Subsequently, Mr. Demetrios Karakitsios, Computer and Telecommunications Engineer, MSc., from the Ephorate of Antiquities of Larissa, spoke about the digital Diachroniko Museum of Larissa, detailing the museum’s effort to follow the new technological trends, to improve its digital presence and to offer modern digital services to its visitors, describing the original approach, what has been done so far and what are the plans for the future. The first part was closed by Mrs. Ioanna Deligianni, Historian of European Culture – Specialist of Cultural Management MSc., from the Municipal Art Gallery of Larissa – GI Katsigras Museum, who referred to the continuous effort of the Municipal Library as a cultural institution to be in harmony with the new digital reality, such as the transfer of museum spaces to a virtual environment using Virtual Reality and the digitization of a part of the museum collections. 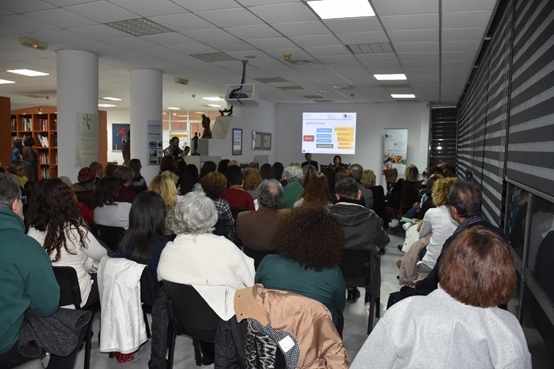 The second part of the Infoday titled “Digital Cultural Heritage Management” included talks by representatives of cultural institutions of the municipality of Larissa and the other municipalities of the Region of Thessaly. Mr. Rizos Haliambalias, President of the Association “Hippocrates in Larissa” presented the main objectives of the Association’s activities, such as the promotion of Hippocrates’ work and the raising of awareness about the relationship between the Father of Medicine and Larissa, as well about the Monument of Hippocrates located in the city. 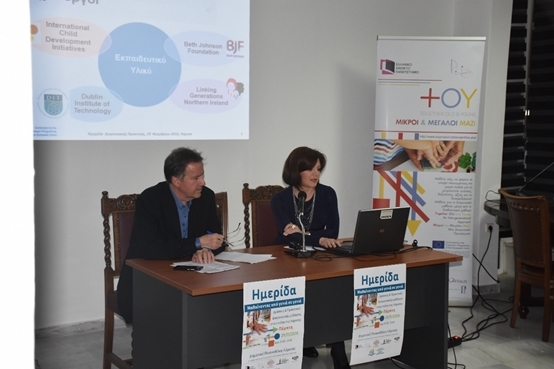 He also presented actions implemented by the Association in cooperation with schools, the Diachroniko Museum of Larissa and other institutions. 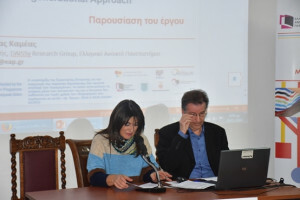 Mrs. Georgia Tsiana, Head of the Public Central Library of Larissa “Konstantinos Koumas”, spoke about the digital services of the Library, which is being modernized, upgrades its infrastructure, and utilizes digital applications through continuous staff training. The main concern is to make the Public Central Library of Larissa more accessible through various activities and digital applications, so that more and more citizens come closer to the book. 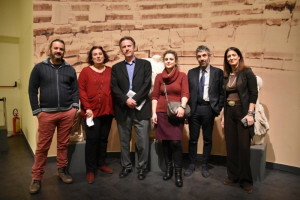 Consequently, Mrs. Konstantina Kontsa, Archaeologist, from the Museum of Wheat and Flour of Larissa, presented the newly established museum, which is also the first industrial museum of the city. She also attempted a brief presentation of a first assessment of the interaction of visitors with the digital and interactive exhibits of the museum’s permanent exhibition. Ms. Ioulia Pentazou, Ph.D. of the Department of Architecture of the University of Thessaly and researcher of the DEMUCIV project, from the Museum of the City of Volos, presented examples of contemporary Western museums where digital exhibits coexist, complement or replace natural exhibits in different ways and to varying degrees. In her presentation she explained how the “trace” of the past is complemented, conversed, overlapped and contrasted with a “construction” of the present in museums of the digital era. Mr. Konstantinos Vouzaxakis, Archaeologist and Head of the Department of Prehistoric and Classical Antiquities and Museums from the Ephorate of Antiquities of Karditsa, made a brief presentation of the digital media and applications used by the Ephorate for the promotion of the cultural heritage of the area, the management of administrative data, the services offered to the citizens, the digitization and recording of the archaeological finds and the cultural reserve as well as the management and protection of the archaelogical spaces. Mrs. Evangelia Defi, Archaeologist and Head of the Department of Byzantine and Post Byzantine Antiquities and Museums from the Ephorate of Antiquities of Trikala, presented the educational programs of the Ephorate with the use of digital technology, giving as an example the educational program in the archaeological site of Ancient Trikke. 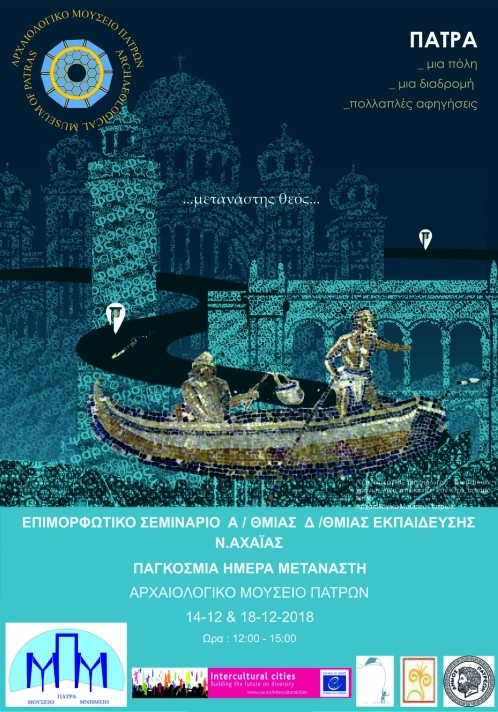 In the context of the participation of the Ephorate of Trikala in the action of the European Cultural Heritage Days held by the Ministry of Culture, with thematic title for 2017/18: “POL(e)IS” (that is, City-Cities), presented an interactive tour of school student groups, which combined the acquaintance with the diachronic monuments of the city through the use of technology. 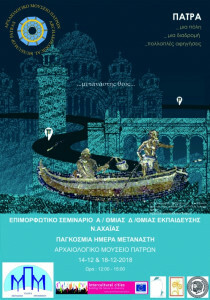 The second part of the Infoday was completed with the speech of Mr. Vassilis Karachristos, Archaeologist of the Volos Ephorate of Antiquities, who presented the Ephorate’s website and its contents, emphasizing on archaeological sites, monuments, museums, educational programs and publications and the importance of the presence of the Ephorate in the digital world. 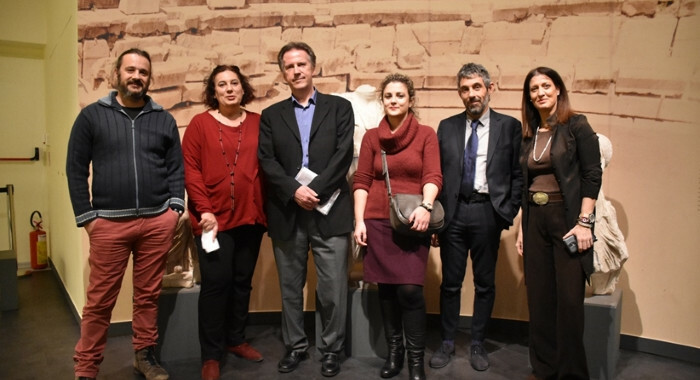 The event was attended by museum professionals, students and graduates of cultural studies programs, scientists, researchers, teachers as well as workers from the Ephorates of Antiquities of Larissa, Trikala, Karditsa and Magnesia. 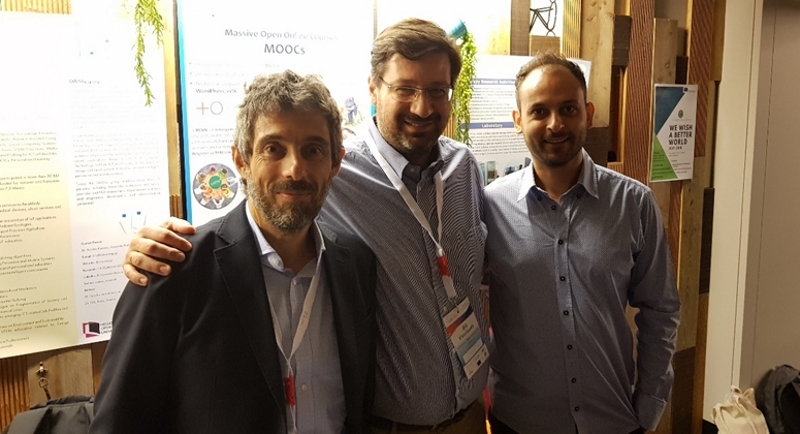 Perhaps for the first time, representatives from all four Ephorates participated simultaneously at an event about new technologies in museums and the development of the relevant skills by their employees. Through their interventions, the representatives of the Ephorates and the other speakers informed the audience about the important work carried out by the cultural and educational institutions and services of the Region of Thessaly and indicated the future development directions and the emerging needs of the employees. 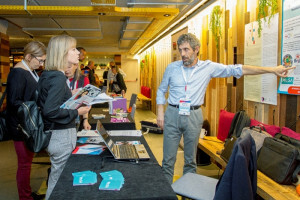 In conclusion, the Infoday has been a major success, attracting more than 80 participants, and has also gained considerable visibility in local media. The participants had the opportunity to exchange ideas and practices on the professional and organizational development of cultural organizations and their link with education, to discuss the benefits of relevant actions and the obstacles they face, and to create synergies to address of them. The Infoday concluded with a short tour of the exhibits of the Diachroniko Museum of Larissa, one of the most modern museums in the country. 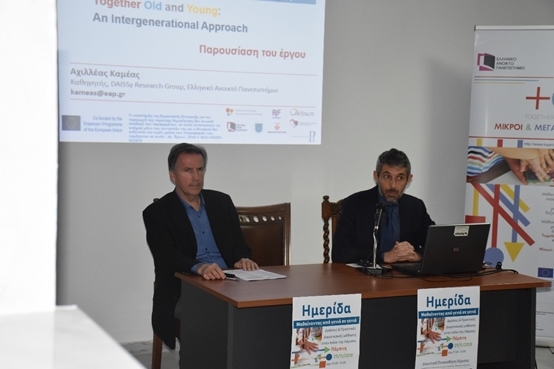 The Infoday on Intergenerational Learning titled “Learning From Generation to Generation” was held with success and remarkable participation at the Municipal Art Gallery of Larissa – GI Katsigras Museum, on 29 November 2018. The event was co-organized by the DAISSy research group of Hellenic Open University, the Municipal Art Gallery of Larissa, the “Hippocrates in Larissa” Association and the Larissa Deputy Mayor of Social Policy, as part of the “Larissa learning city” initiative. The staff of the Public Relations Department and the Larissa Branch of HOU had an important contribution to the success of the Infoday. 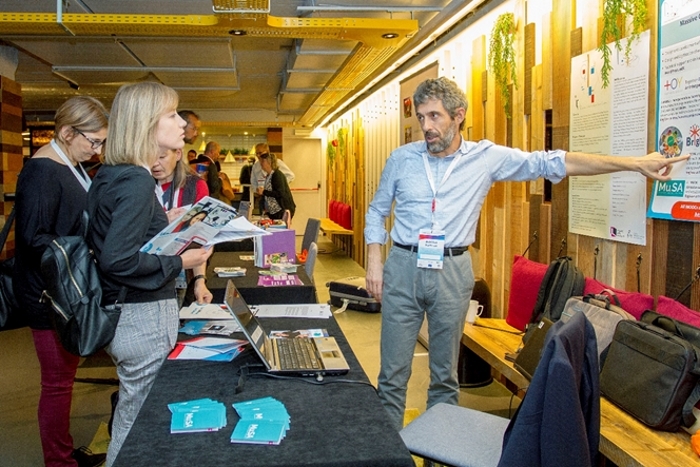 The main objective of the event was to present the results of the European project TOY+: Together Old and Young, which was implemented as a Strategic Partnership under the Erasmus + program, with the participation of DAISSy as the partner responsible for the development of the relevant Massive Open Online Course (MOOC). At the beginning of the Infoday, the Deputy Mayor of Social Policy, Mr. Dimitris Deligiannis, the Regional Director of Education of Thessaly, Mrs. Eleni Anastasopoulou, and the Vice-President of the Municipal Art Gallery of Larissa, Mrs. Anni Psarra, addressed welcome speeches. 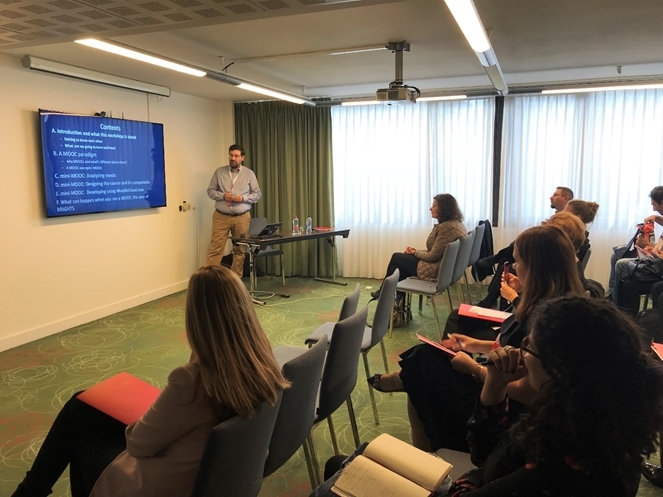 Initially, Mr. Achilleas Kameas, Professor of Hellenic Open University, presented the content and results of the TOY+ project, as well as the research activities of the DAISSy group and the projects in which the group participates. Mrs. Vicky Maratou, DAISSy researcher, presented the MOOC entitled “Together Old and Young: An Intergenerational Approach” and the TOY for Quality initiative. The online course provides knowledge and skills about implementing intergenerational practice with young children and the elderly. Next, actions and practices of intergenerational learning between the elderly and children, which have been or will be held in Larissa, were presented. Extensive reference was made to the possibility of implementing intergenerational learning actions within Museums such as the Folklore Historical Museum, the Diachroniko Museum, the Municipal Art Gallery, and the Museum of National Resistance of Larissa. More specifically, Mrs. Fani Kalokerinou, Director of the Folklore Historical Museum of Larissa, stated that museums are one of the most prominent establishments for social learning where creative ideas, feelings and relationships between people and between people and objects find space for expression and development. Intergenerational learning is a mutually beneficial process for all participants that contributes to the transfer of knowledge and experience from the older to younger generations of visitors. The Folklore Historical Museum of Larissa implements a variety of intergenerational learning actions, promoting the mutual development of an educational relationship between the different generations and fostering the cultivation of social cohesion and the minimization of the generation gap. The head of the National Resistance Museum of Larissa, Mrs. Anna Iakovidou, referred to some intergenerational activities that took place in the Museum, such as the interview given by Lazaros Arsenis to the students of the 1st Elassona Lyceum and the guided tours organized by the Friends of the Society National Resistance Museum for Primary, Secondary and High School students. The teacher, Mrs. Kalliopi Perri, referred to the period when the 26th Primary School of Larissa “adopted” the Diachroniko Museum of the city. The students discovered the wealth of the museum and presented it to their parents in their own, special way. The harmonious combination of the musical expression of school students with the techniques of theatrical play and artistic creation led to an interesting tour of all the museum’s premises. The teacher, Mrs. Crystallia Makatou, talked about intergenerational learning at the Municipal Art Gallery – GI Museum. Katsigras, a place of informal and experiential learning. The direction of the museum includes actions involving various age groups and events that revive tradition. The president of the club “The Hippocrates in Larissa” association, Mr. Rizos Haliambalias, presented an action of the association at the Diachroniko Museum of Larissa, where children narrated, interpreted and interacted with the timeless exhibits of the museum through speech, movement and music. Visitors watched the children’s presentations by following a specific route inside the museum. Mrs. Chrysa Hatziavraam, on behalf of the Larissa Public Central Library, spoke about the various intergenerational actions implemented in the Library, such as readings and narratives of folk tales, familiarization of children with older customs and traditional games, sharing knowledge and experiences of children with parents and / or their grandparents, adult literacy with computers, a program focused on intergenerational relationships aimed at self-awareness, better communication and improvement of children’s relationships s with the elderly. The philologist Ioanna Giannakopoulou spoke on “Reading oneself through others: three generations reading practices in a narrative of life”. The pedagogical officer of the network of Centers for the Creative Engagement of Children of the Municipality of Larissa, Mrs. Lina Moussioni, referred to the program “Young and Large in Time Machine”, which is a pilot project in the context of exploring the possibilities of intergenerational connection to the network of Centers for the Creative Engagement of Children of the Municipality of Larissa. Its goal is to engage in a program of creative activities, aimed at children ages 5 to 12 years, the experience and knowledge of the elderly through regular meetings and collaborative activities. The archaeologist-social anthropologist Mrs. Konstantina Kontsa presented examples of the recording of the oral history and intergenerational approach having as common axis the city and its people and referred to the “Oral History Workshop” to be implemented in the Center for Engagement of the Elderly of the Municipality of Larissa within the framework of the “Citizens’ University”. 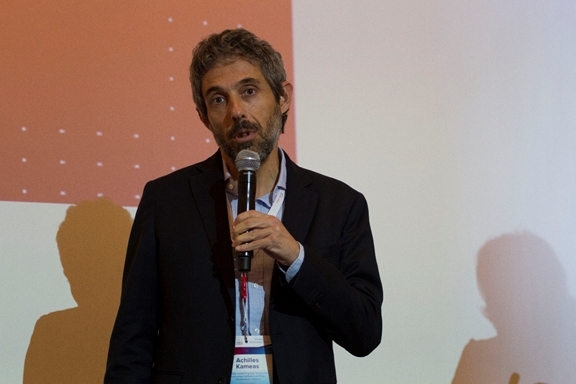 Mr. G. Metaxiotis , doctorate of the Department of Journalism and Mass Media of the Aristotle University, developed the subject “Digital narrative and intergenerational learning”. 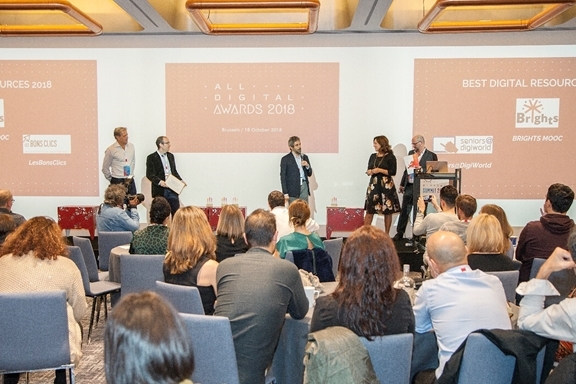 In conclusion, the Infoday has been a major success, attracting more than 80 participants, and has also gained considerable visibility in local press and media. The participants had the opportunity to exchange ideas and practices about intergenerational learning, to discuss the benefits of the actions and the obstacles they face, and to create synergies to address them. The Infoday concluded with a short tour of the exhibits of the Municipal Art Gallery of Larissa, which hosts the collection of G. I Katsigras and is one of the most important galleries in the country. 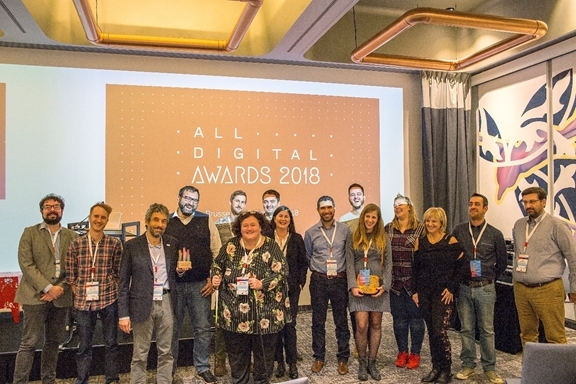 Η διεθνής εκδήλωση ALL Digital Summit 2018 έλαβε χώρα στις Βρυξέλλες 18 και 19 Οκτωβρίου 2018. Η ερευνητική ομάδα DAISSy του ΕΑΠ είχε ισχυρή παρουσία, προβάλλοντας το ερευνητικό της έργο και το Ίδρυμα γενικότερα, σε ένα κοινό που ξεπερνούσε τα 150 άτομα, τα οποία προέρχονταν από οργανισμούς εκπαίδευσης και κατάρτισης που εδρεύουν σε περισσότερες από 20 Ευρωπαϊκές χώρες. Το περίπτερο της ερευνητικής ομάδας DAISSy στελέχωσαν ο Καθηγητής ΕΑΠ και Διευθυντής της DAISSy Α. Καμέας, ο Καθηγητής ΤΕΙ Δυτ. Ελλάδας και ερευνητής της DAISSy Β. Βασιλειάδης και ο Δρ. Θ. Παναγιωτακόπουλος, επιστημονικός συνεργάτης του Εργαστηρίου Κινητού και Διάχυτου Υπολογισμού, Ποιότητας και Περιρρέουσας Νοημοσύνης του ΕΑΠ. Τα μέλη της DAISSy ενημέρωναν τους επισκέπτες για το χαρακτήρα και την αποστολή του ΕΑΠ, τα έργα που υλοποιεί η ομάδα και τα μελλοντικά ερευνητικά σχέδια, ενώ διένειμαν και φυλλάδια των έργων. Κατά τη διάρκεια ειδικής τελετής, απονεμήθηκε στην DAISSy το πρώτο βραβείο Καλύτερου Ψηφιακού Εκπαιδευτικού Πόρου (Best Digital Resource) για το Μαζικό Ανοικτό Διαδικτυακό Μάθημα (Massive Online Open Course – MOOC) με τίτλο “Addressing Global Citizenship Education through Digital Storytelling”, το οποίο αναπτύχθηκε το 2017 υπό την επίβλεψη ερευνητών της DAISSy στο πλαίσιο του Ευρωπαϊκού έργου BRIGHTS. Η επιλογή έγινε μετά από ψηφοφορία ειδικών, αλλά και μελών του Ευρωπαϊκού δικτύου φορέων ALL Digital. Περισσότερα μπορείτε να μάθετε εδώ. 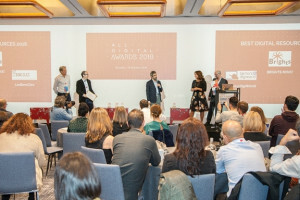 Η ερευνητική ομάδα DAISSy διοργάνωσε το εργαστήριο “How to promote STEM education and training with Mobile and Internet of Things technologies – Πώς να προωθήσετε την εκπαίδευση STEM και την κατάρτιση με τις τεχνολογίες κινητού υπολογισμού και Διαδικτύου των Πραγμάτων”, το οποίο υποστηρίχθηκε από το έργο UMI-Sci-Ed. Το εργαστήριο αποσκοπούσε στο να κατανοήσουν οι συμμετέχοντες τον αντίκτυπο των τεχνολογιών κινητού υπολογισμού και IoT σε οργανισμούς που παρέχουν εκπαίδευση και κατάρτιση και το επιχειρηματικό δυναμικό που αυτές προσφέρουν. Ο στόχος ήταν οι συμμετέχοντες όχι μόνο να αρχίσουν να καταλαβαίνουν πώς να μετασχηματίσουν τους οργανισμούς τους αλλά και να αποκτήσουν κάποιες γνώσεις σχετικά με το θέμα ώστε να διαδώσουν τις νεοαποκτηθείσες δεξιότητες στις κοινότητες και τις περιφέρειές τους. Περισσότερα μπορείτε να μάθετε εδώ. Επιπλέον, η DAISSy διοργάνωσε το εργαστήριο “How to create a mini-MOOC – Πώς να δημιουργήσετε ένα mini-MOOC”, το οποίο υποστηρίχθηκε από το έργο BRIGHTS. Στόχος αυτού του εργαστηρίου ήταν να δώσει στους συμμετέχοντες μια γενική εικόνα των τρεχουσών τάσεων ανάπτυξης MOOC, των προκλήσεων σχεδιασμού και ανάπτυξης και των ζητημάτων της εξ αποστάσεως εκπαίδευσης. Περισσότερα μπορείτε να μάθετε εδώ. Η ερευνητική ομάδα DAISSy είχε εξαιρετικά θετική παρουσία στην εκδήλωση ALL Digital Summit 2018. Το περίπτερο προσέλκυσε σημαντικό αριθμό επισκεπτών. Καθ’όλη τη διάρκεια της εκδήλωσης, περισσότερα από 100 άτομα επισκέφτηκαν το περίπτερο, ενημερώθηκαν για τις δραστηριότητες της DAISSy και εκδήλωσαν ενδιαφέρον για μελλοντική συνεργασία στο πλαίσιο ερευνητικών έργων. Δημιουργικές συναντήσεις έλαβαν χώρα, οι οποίες οδήγησαν σε καινοτόμες και υποσχόμενες ιδέες. Το περιεχόμενο των δύο εργαστηρίων αποδείχθηκε πολύ ελκυστικό, καθώς αθροιστικά συμμετείχαν σε αυτά περισσότερα από 60 άτομα, τα οποία εκπαιδεύτηκαν σε σύγχρονες εκπαιδευτικές πρακτικές (MOOCs και εκπαίδευση STEM). Μέσα από την αλληλεπίδραση που έλαβε χώρα, αναδείχθηκαν οι ανάγκες των οργανισμών κατάρτισης στα ανωτέρω αντικείμενα, τις οποίες θα επιχειρήσει να καλύψει η DAISSy στο πλαίσιο κοινών ερευνητικών έργων. H βράβευση της DAISSy αποτελεί αναγνώριση της υψηλής ποιότητας και χρησιμότητας των αποτελεσμάτων που παράγει μέσα από τη συμμετοχή της σε κοινοπραξίες Ευρωπαϊκών έργων. Όπως ανέφερε κατά την ομιλία του ο Καθηγητής Αχιλλέας Καμέας, η επίτευξη σημαντικών αποτελεσμάτων προϋποθέτει συμμετοχή, συνεργασία, αίσθημα ευθύνης αλλά και την δυνατότητα ενσωμάτωσης της απαραίτητης καινοτομίας και την ικανότητα καθοδήγησης της ομάδας προς τον συγκεκριμένο στόχο, ικανότητες που διαθέτει σε πολύ μεγάλο βαθμό η ερευνητική ομάδα DAISSy. Κατά τη διεθνή εκδήλωση ALL Digital Summit 2018, η οποία έλαβε χώρα στις Βρυξέλλες 18 και 19 Οκτωβρίου, απονεμήθηκε στην ερευνητική ομάδα DAISSy του ΕΑΠ το πρώτο βραβείο Καλύτερου Ψηφιακού Εκπαιδευτικού Πόρου (Best Digital Resource) για το Μαζικό Ανοικτό Διαδικτυακό Μάθημα (Massive Online Open Course – MOOC) με τίτλο “Addressing Global Citizenship Education through Digital Storytelling”, το οποίο αναπτύχθηκε το 2017 υπό την επίβλεψη ερευνητών της DAISSy στο πλαίσιο του Ευρωπαϊκού έργου BRIGHTS. Η επιλογή έγινε μετά από ψηφοφορία ειδικών, αλλά και μελών του Ευρωπαϊκού δικτύου φορέων ALL Digital. Το βραβείο παρέλαβε εκ μέρους της κοινοπραξίας του έργου BRIGHTS ο Δρ. Αχιλλέας Καμέας, Καθηγητής του ΕΑΠ και επικεφαλής της ερευνητικής ομάδας DAISSy. Η τελετή έλαβε χώρα στο Inspire room του Hotel Bloom στις Βρυξέλλες, με την παρουσία περισσότερων από 100 συμμετεχόντων, ενώπιον των οποίων ο κ. Καμέας, αφού ευχαρίστησε όλους όσοι συμμετείχαν στην δημιουργία του MOOC, αναφέρθηκε στην προσπάθεια που κατέβαλλαν οι ερευνητές της ομάδας DAISSy για την ανάπτυξη μιας φιλικής διαδικτυακής πλατφόρμας MOOC και υψηλής ποιότητας ψηφιακού εκπαιδευτικού περιεχομένου. Όπως είπε, η πρώτη απόπειρα διάθεσης του MOOC προσέλκυσε περίπου 1.300 εγγραφές (το 40% των εκπαιδευόμενων το ολοκλήρωσε με επιτυχία), ενώ η επόμενη διάθεση θα γίνει στο πρώτο 6μηνο του 2019. Οι ενδιαφερόμενοι πρέπει να παρακολουθούν την ιστοσελίδα (link) . Περισσότερες πληροφορίες για την τελετή θα βρείτε εδώ, ενώ μπορείτε να διαβάσετε για το MOOC του έργου BRIGHTS εδώ. Μπορείτε να ενημερώνεστε για τις δράσεις και τα έργα της ερευνητικής ομάδας DAISSy από την ιστοσελίδα της (link). Η Εφορεία Αρχαιοτήτων Αχαΐας διοργανώνει επιμορφωτικό σεμινάριο που θα διεξαχθεί την Τρίτη 18 Δεκεμβρίου 2018, 11:45-15:00, στο νέο Αρχαιολογικό Μουσείο Πατρών. Το σεμινάριο απευθύνεται σε εκπροσώπους φορέων, οργανώσεων, Συλλόγων (συμπεριλαμβανομένων των Συλλόγων Μεταναστευτικών Κοινοτήτων) που ασχολούνται με ζητήματα διαπολιτισμικού χαρακτήρα, καθώς και σε κάθε πολίτη με ενδιαφέρον για την κοινωνική συνοχή και τα ανθρώπινα δικαιώματα. Στόχος είναι μέσα από την επαφή με επιλεγμένα ψηφιδωτά, γλυπτά, μνημεία της πόλης, οι συμμετέχοντες να γνωρίσουν τις πτυχές της πολυπολιτισμικής Πάτρας των ρωμαϊκών χρόνων, που αποτελούσε σημαντικό πολυεθνικό και κοσμοπολίτικο κέντρο, αποβλέποντας στην κατανόηση και ερμηνεία της πολιτιστικής ταυτότητας της πόλης. Παράλληλα, μέσω ανάδειξης της διάστασης της διαπολιτισμικότητας των μνημείων, θα αναδειχτούν στοιχεία, όπως ο σεβασμός στη διαφορετικότητα, η δημοκρατία, η αλληλεγγύη και βασικές πανανθρώπινες αξίες, όπως η δικαιοσύνη, η ισότητα, η καταπολέμηση διακρίσεων. Αναλυτικότερα, στο πλαίσιο του 2018 Ευρωπαϊκού Έτους Πολιτιστικής Κληρονομιάς (ΕΕΠΚ) σχεδιάστηκε το Πολιτιστικό Δίκτυο «Πάτρα μια πόλη μια διαδρομή με πολλαπλές αφηγήσεις» με στόχο την υλοποίηση Πολιτιστικών Διαδρομών στην πόλη των Πατρών και τη συσχέτιση με τις συλλογές του Αρχαιολογικού Μουσείου Πατρών. Έχει ως επίκεντρο επιλεγμένους αρχαιολογικούς χώρους, βυζαντινά μνημεία και νεώτερα (τα οποία βρίσκονται στον κεντρικό αστικό ιστό της πόλης των Πατρών) σε συνδυασμό με τις «αφηγήσεις» τους. Θεματικές ομιλίες, παρουσιάσεις και εκπαιδευτικές δράσεις στις αίθουσες του Αρχαιολογικού Μουσείου Πατρών αλλά και μέσα στην πόλη για μαθητές και κοινό. Αξίζει να σημειωθεί η σύνδεση του Πολιτιστικού Δικτύου με τη δραστηριοποίηση του Δήμου Πατρέων ως μέλος στο διεθνές δίκτυο «Διαπολιτισμικές πόλεις» (InterCultural Cities-ICC) καθώς και στο δίκτυο «ALDA: Ευρωπαϊκή Ένωση για την Τοπική Δημοκρατία (European Association for Local Democracy)». Στο πλαίσιο αυτό, περιλαμβάνεται και η σύνδεση του σεμιναρίου της 18ης Δεκεμβρίου 2018 και προβολής του από το Δήμο Πατρέων μέσω των δύο ανωτέρω δικτύων πόλεων. Η συνολική δράση του Πολιτιστικού Δικτύου θα ολοκληρωθεί από την ΕΦΑΑ το καλοκαίρι του 2019 με την υλοποίηση παράλληλων δράσεων και εκθέσεων στο Αρχαιολογικό Μουσείο Πατρών, στο πλαίσιο και του εορτασμού των δέκα ετών λειτουργίας του Αρχαιολογικού Μουσείου Πατρών, υπό το πρίσμα μιας ολιστικής προσέγγισης και ανάδειξης της Πολιτιστικής Κληρονομιάς της πόλης μας. Ακολουθεί το πρόγραμμα του σεμιναρίου – η ΕΦΑΑ και ο Δήμος Πατρέων καλούν κάθε ενδιαφερόμενο να συμμετέχει! 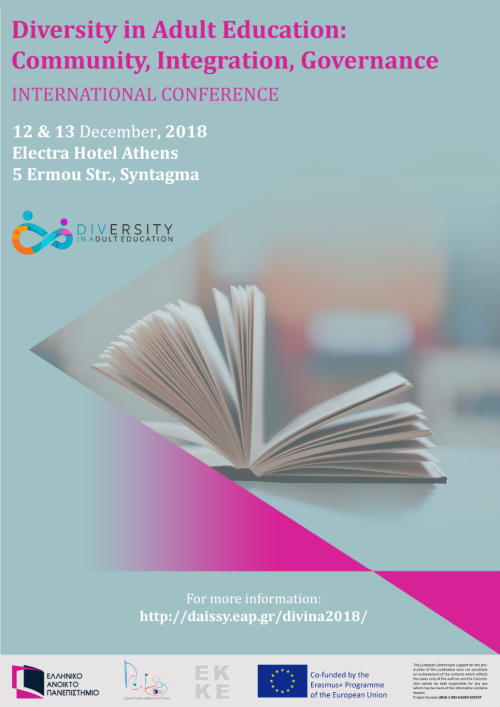 The DAISSy research group of Hellenic Open University (HOU) and the National Center for Social Research (EKKE) are organizing the International Conference “Diversity in Adult Education: Community, Integration, Governance”. The conference will take place on Wednesday 12th and Thursday 13th December 2018, in Athens, at Electra Hotel (Ermou 5, Syntagma, 1st floor, Athena Hall). 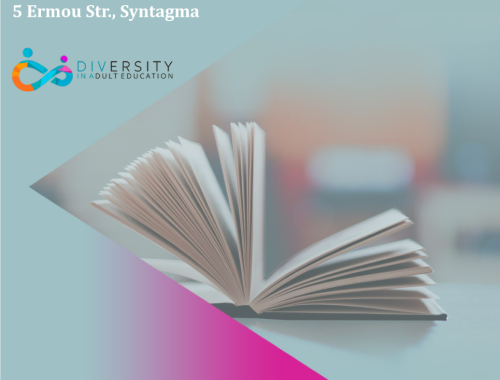 The aim of the conference is to highlight approaches and practices relating to the wide range of adult education (formal and informal) and their association with the understanding and management of diversity. In addition, the conference is exploring the effects of this association on issues of social inclusion, community formation and governance. The conference is addressed at educators, researchers and professionals related to education, immigrants, NGOs and voluntary organizations, public sector bodies as well as representatives of local government. The conference marks the completion of the transnational European project “DIVINA-EDU: Diversity in Adult Education”, which was implemented as a KA2 Strategic Partnership under the Erasmus + program coordinated by the Centro de Formación Somorrostro (Spain) and partners from four Member States EU (Spain, Italy, Greece, Portugal), including the DAISSy Research Group of HOU. Participation to the conference is free of charge. Participants will be given an attendance certificate. Conference languages: English and Greek.